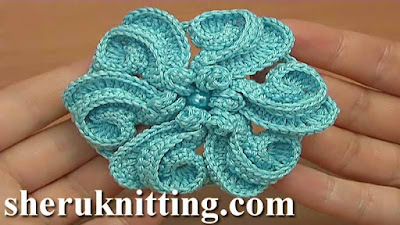 I will be making a gorgeous curled 6-petal flower with spirals in the centre in this crochet flower tutorial. All 6 double-petals consist of 2 parts: the first one is crochet curl and another one is half of the petal. The half of the petal is made as a trim. We crochet a spiral in the centre in the process of making each double-petal of the crochet flower.